Oceanic and atmospheric conditions returned to ENSO-neutral over the last month (Figs. 1-2) and most ENSO forecasts and outlooks reflect this transition. On May 8, the Australian Bureau of Meteorology maintained its ENSO Outlook at “inactive,” with indications of neutral conditions persisting through at least this summer. On May 10, the NOAA Climate Prediction Center (CPC) issued its final La Niña advisory, indicating that ENSO-neutral conditions had returned and were favored to continue through November, and then showing a 50-percent chance of an El Niño event developing this winter. On May 10, the International Research Institute (IRI) issued its ENSO Quick Look, which showed ENSO-neutral conditions in oceanic and most atmospheric indicators, although “the precipitation pattern and the upper level wind anomalies continued to show lingering weak La Niña conditions.” The Quick Look called for neutral conditions through fall but a “nearly 50-percent chance” of El Niño by the end of the year. On May 11, the Japanese Meteorological Agency (JMA) identified lingering La Niña conditions that would end this spring and a 70-percent chance of ENSO-neutral conditions over summer. 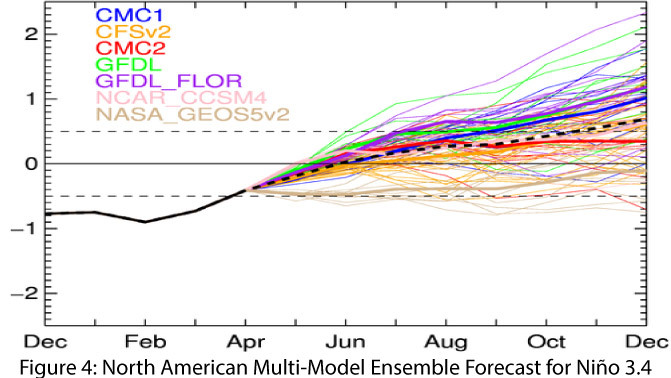 The North American Multi-Model Ensemble (NMME) returned to ENSO-neutral conditions, also noting a trend consistent a possible return to El Niño conditions by year’s end, albeit with considerable uncertainty over the latter half of 2018 (Fig. 4). Summary: With La Niña in the rearview mirror, we turn to what comes next. ENSO-neutral conditions are a near-certainty in the short term regardless of what later 2018 might hold. Taking a longer view, the most likely outcome is ENSO-neutral conditions persisting through fall, followed by a roughly 50-percent chance of El Niño conditions forming by winter. But these forecasts come with caveats. First, this time of year is notoriously difficult to forecast, given the presence of the so-called spring predictability barrier. Seasonal transitional conditions bring a high degree of uncertainty to any longer-term forecast. The NMME plot in Figure 4 provides a good illustration of the wide range of predicted outcomes. This plot also highlights the low probability of a return to La Niña conditions in 2018. Second, a closer look at how this forecast compares to climatology is probably a better metric of what we might expect in 2018. 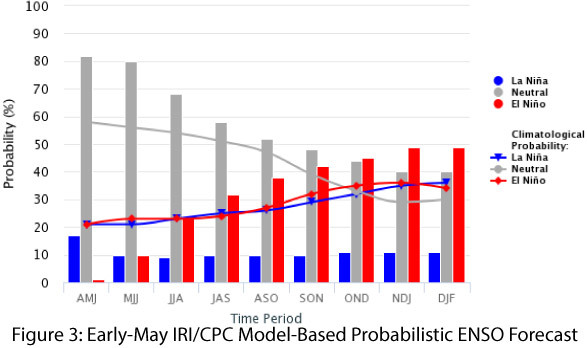 The IRI plots reveal a “nearly 50-percent chance” of El Niño (Fig. 3 above) is really only about a 15-percent increase in probability above climatology, while the roughly 10-percent chance of La Niña is about 25 percent below climatology. This comparison further reinforces the point that while an El Niño event is plausible by the end of 2018, it is far from certain. 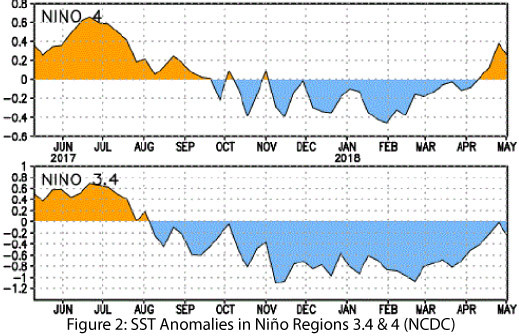 Similarly, a La Niña event by the end of 2018 is not implausible, but it is far from likely. Until more information is available later this summer, the uncertainty embedded in these forecasts remains frustratingly high, as it does every year at this time.